My usual practice was to begin every choir rehearsal with physical stretches followed by vocal warm-ups and solfège exercises (or both rolled into one) before beginning to work on the material the choir was preparing for performance. 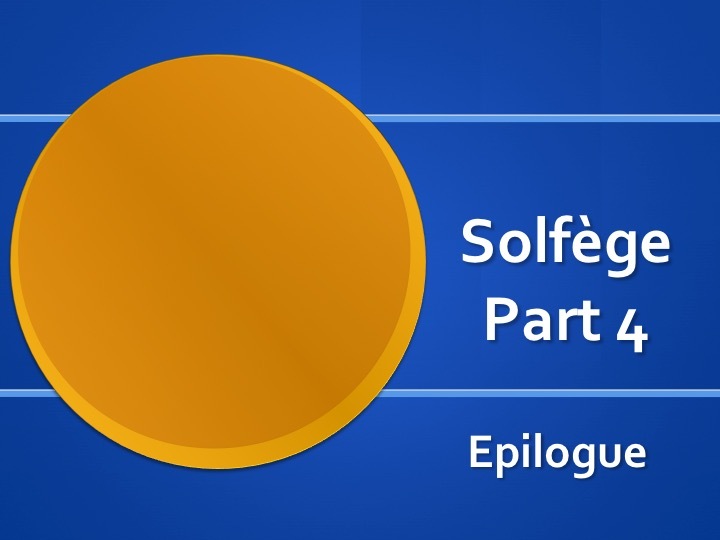 Any teacher or director who uses solfège will collect these sorts of exercises, games, and activities as ways to address or develop specific skills and competencies. For instance – and this is a common technique I believe – with children’s choirs trained on solfège and hand signs, one warm-up I frequently used was to split the choir into two groups and stand before them using Curwen hand signs with both hands, my left hand indicating what one half of the choir would sing and my right hand indicating for the other half. The simplest form of this exercise would be to hold one group on do while the other group sang the scale slowly and deliberately, tuning each interval, ascending and descending – and then repeating the same exercise reversing the role each group had played in the first time through the exercise. With more advanced children’s choirs I was able to do more developed and faster elaborations of this exercise, indicating the scale sung in canon or even freely improvised melodies with different hand signals in each hand – often to limits not dictated by the children’s abilities but by my own! One exercise I taught and used frequently I initially learned from students, who had learned it from a previous teacher. 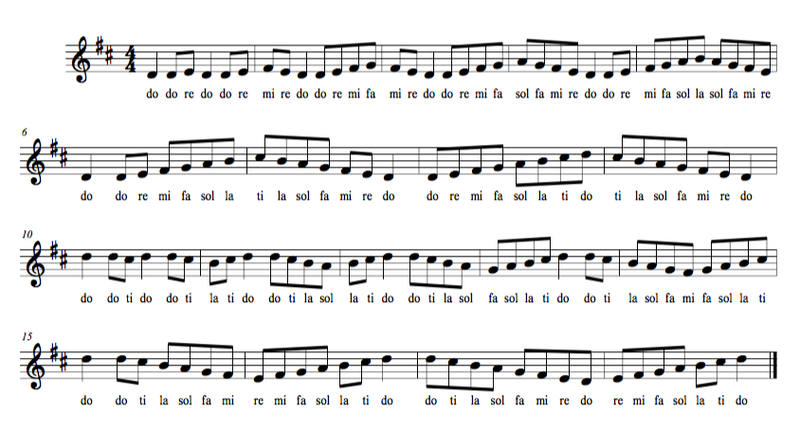 I later found that virtually every choir director or singer who used solfège knew/used this exercise. I never learned what it is called although I used it for years. I am calling it the cumulative exercise here. The cumulative exercise is a good general warm-up and good for developing facility and fluency with the syllables. 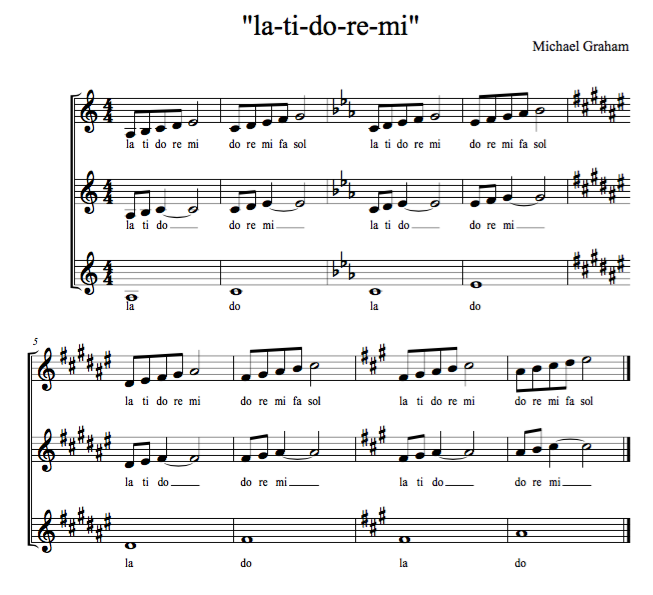 In my experience students who had learned this exercise took delight in singing it on their own as well, and enjoyed trying to sing it as fast as possible! One variation another choir director introduced me to is sing it eliminating one syllable, inserting an eighth rest in its place – for instance, sing it leaving out mi. This variation was sure to result in laughter from young singers, every time: a very good thing. I used this exercise regularly but with one extrapolation/modification. In my experience I have observed school music teachers in general, when teaching scales or exercises, to concentrate primarily (or even exclusively) on the Major scale, largely ignoring minor scales altogether. I have never heard of (competent) private teachers doing this – it seems to be school music teacher phenomenon. I believe it comes from the competition-focused climate that (for the most part) instrumental music teachers function in. For instance, the local regional honors band and orchestra auditions (Mid-State and All-State) only require students to play Major scales, so for the most part, school music teachers do not teach minor scales – at least those I have met, observed, or spoken to about this. It’s basically an example of “teaching to the test”. However, so much of the repertoire is in minor keys, and it is the other side – the shadow and complement of Major – of our entire tonal system. Since music literacy was always my goal as a teacher and I taught the solfège method (movable do with la-based minor) that is based on Major-minor relativity, I always tried to give both Major and minor equal emphasis in my program. So we sang the cumulative exercise in natural minor as well, every time we sang it. Another exercise I used frequently was invented by my friend and mentor Michael Graham. Section the choir into three groups and assign each one a part. 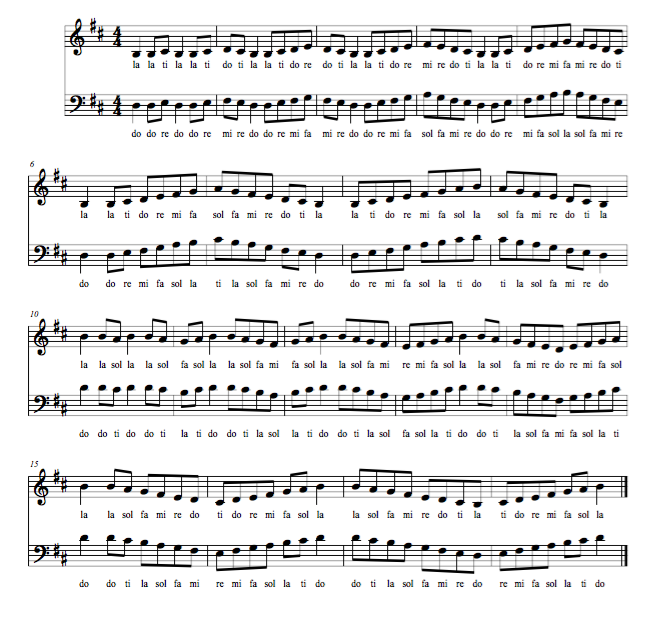 We would sing this through three times, each time starting a half step higher – until each section had sang each part. This exercise subtly teaches/reinforces understanding of relative and parallel key relationships as well as Major and minor triads, is a great warm up and…students would regularly beg to sing it. 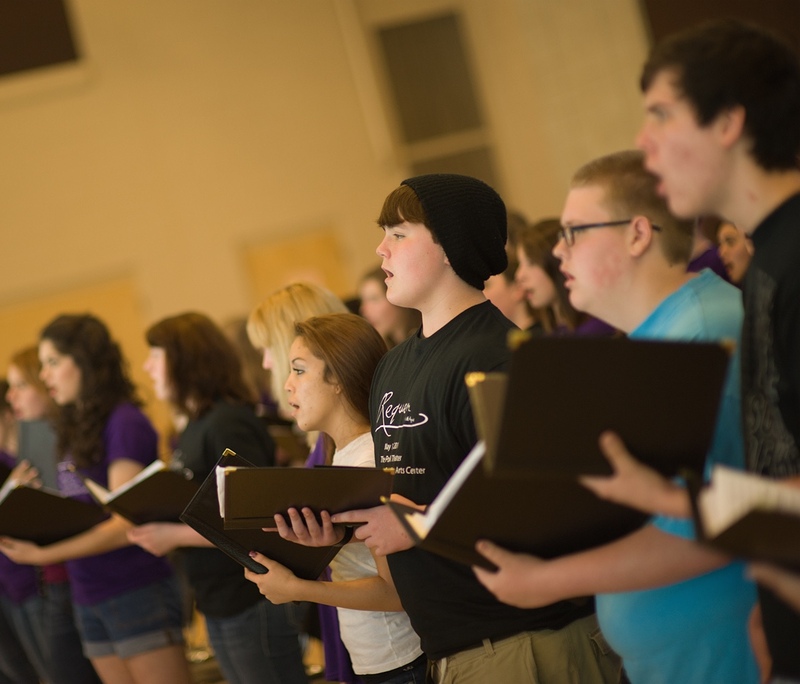 In January of 2012 I decided to teach all of my high school choirs at Nashville School of the Arts as many choruses from the Mozart Requiem as we could learn in four months and to then perform them en masse at our spring concert in May with Music City Youth Orchestra, of which I was also the music director. This was the beginning of what became known as the NSA Festival Choir. I know: what was I thinking? I could write a lot about that spring – and perhaps some day I may – but for now I will just stay close to the solfège discussion and state that for most of us it was a very positive experience, the students and I learned so much, and it was an experience that none who were involved will ever forget. I survived. We also learned Freddie Mercury’s Bohemian Rhapsody and the closing chorale Du Heilige Brunst from Sebastian’s Motet BWV 226, and performed all of this with the orchestra at the Tennessee Performing Arts Center on May 1, 2012. We could never have done all this without solfège, and we learned some remarkable things from our solfège practice with Amadeus. He had been there before us. The first movement we learned was Rex Tremendae, which begins grand and majestic and ends as a plaintive whimper. 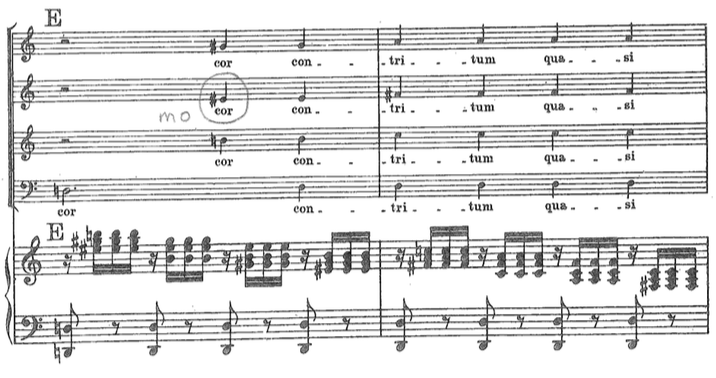 On the final page of this movement, first the sopranos and altos plead in thirds “salve me!” (save me) which is echoed an octave lower in the next bar by the tenors and basses. 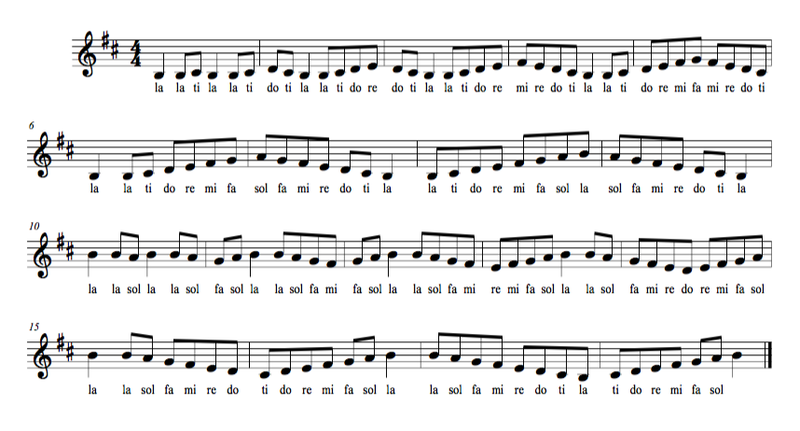 In our movable do, la-based minor solfège method, the syllables for the soprano voice (the melody) in the first of these statements are “sol-fi-mi” and in the echo of the melody sung by the basses in the next measure they are “sol-fa-mi”. The solfège is the text. 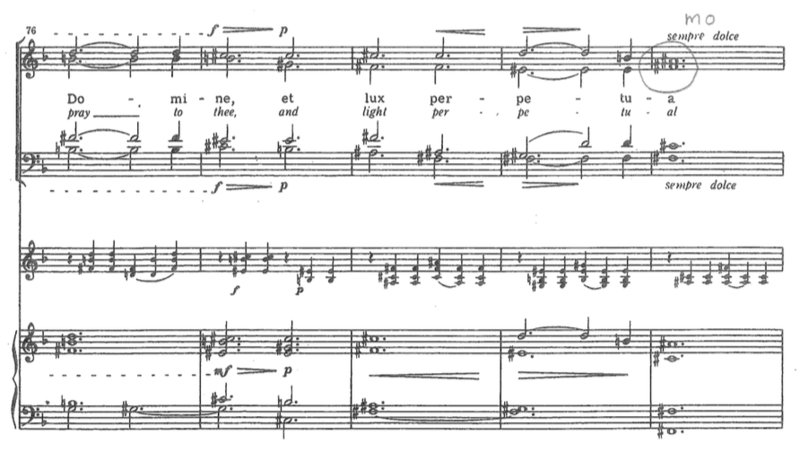 Here, in one of the most pathetic and touching moments of the entire Requiem, Amadeus makes a joke. Discovering this in rehearsal made us feel like initiates – for a moment it was as if I could see him there, in the mind’s eye, winking at me across the centuries. This memory touches me, and I marvel that even when things seem darkest, Amadeus could still be light-hearted, if only for a moment. Some essential quality of Mozart the man peers through the perfection of the music here and smiles. I remember the moment in rehearsal when we realized it, and the impact it made on all of us then. I can still feel it, writing about it now. And we never would have had this experience – we never would have had this intimate glimpse of Amadeus – if we hadn’t been singing Rex Tremendae on solfège syllables. And henceforth – in my program at least – the syllable for the raised fifth scale degree in minor (or raised third scale degree in Major ) was known as mo, in Mozart’s honor. 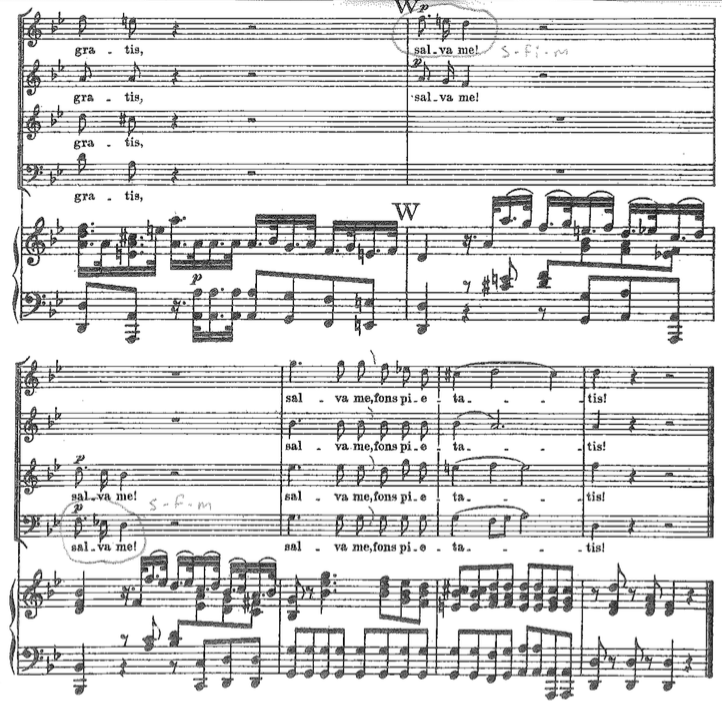 It’s a pretty rare syllable to have to use – the only other time we encountered it was two years later when we were learning the Fauré Requiem. Fauré writes an A# for the sopranos in bar 80 of the Libera Me: again a raised fifth scale degree, this time in D minor. Esoteric jokes and syllables aside, when I look back on all the years I spent time each day practicing solfège as a teacher, I realize that its impact on my musicianship and understanding of music has been incalculable. I can only imagine how much deeper and more profound it would have been, had someone taught it to me when I was a child. By walterbitner in Choral, Education, Music Education, Pedagogy, Solfège on September 11, 2015 .